You may see VGH & UBC Hospital Foundation fundraisers come to your doorstep to talk to you about becoming a monthly donor. Recurring monthly donations are a powerful way to make your support go further and save more lives by providing a steady and predictable source of funding to support the most urgent needs in our hospitals and health care centres. Monthly support ensures that the best treatments are available and the latest equipment is being used. Together, we will reduce the crucial link that makes good health care better in BC. With your vital support, we will reduce wait times, provide more targeted care for the vulnerable, enable better outcomes to those in critical condition, and improve the overall health care experience. Our partner, Globalfaces Direct Inc., is a Canadian leader in door-to-door fundraising. True North Consulting recruits on behalf of Globalfaces Direct in Metro Vancouver. Professional fundraisers will be knocking on doors to help us reach out to communities all across Metro Vancouver who would like to support VGH & UBC Hospital Foundation. Our fundraisers are compensated through an hourly wage with no commission. They receive training, which allows them to speak on behalf of the Foundation about our mission and fundraising priorities. Why does VGH & UBC Hospital Foundation do door-to-door fundraising? Face-to-face fundraising is one of the most effective and personal ways we can reach out to donors. VITAL is the important work of VGH & UBC Hospital Foundation. It’s the crucial link that makes good health care better, enabling us to build new facilities, invest in new equipment and technologies, better meet patient demands and take advantage of new treatments and procedures. While the province funds the day to day operations of our hospitals and health care services, philanthropic gifts help us accomplish our vision of exemplary care and enable us to act on what we know is possible. Your support of the most urgent needs in our hospitals and health care centres will ensure that the best treatments are available and the latest equipment is being used. How do I know if a fundraiser at the door is from VGH & UBC Hospital Foundation? 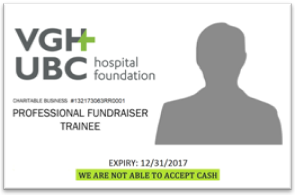 For security and recognition purposes, all VGH & UBC Hospital Foundation fundraisers wear identification badges (as seen below), name tags, branded grey vests, and carry VGH & UBC Hospital Foundation information cards and brochures with details about our life-saving programs and facilities. They are also equipped with tablets in order to securely track and process your donation, and their locations, electronically. 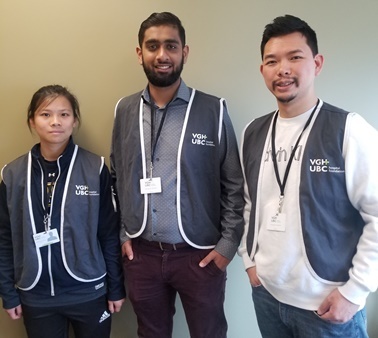 Our canvassers will invite you to take part in VGH & UBC Hospital Foundation’s monthly donation program and WILL NOT accept, nor ask for cash or one-time gifts at the door. We believe this helps to protect both the donor and fundraiser. If you wish to make a monthly gift please note that we will accept void cheques for Electronic Funds Transfer (EFT) and credit card payments. You may also choose to make a single, one-time gift online. Yes, we use tablets with encrypted software to collect payment information in a secure way. Yes, VGH & UBC Hospital Foundation respects your privacy. Any personal information we collect is used for donor-related and tax-receipting purposes, or to keep you informed about our activities, including programs, services, special events, funding needs or opportunities to volunteer. We do not sell, trade or rent out any names or personal information. I live in a high-rise, do fundraisers have permission to be in our building? Yes, Globalfaces Direct Inc. has a strict policy that requires fundraisers to get written permission from the building management or superintendents before entering a multi-dwelling unit. This is a mandatory requirement that must be submitted upon, or prior to, entry of the building. Thank you for joining us as a monthly donor! You will receive an email confirmation within 24 hours of registering and a phone call to welcome you within one week. If you choose to donate by credit card, your first gift will be processed at the door. If you prefer to give by debit, your first gift will be processed by the Foundation within 5-10 business days. If you haven’t received an email confirmation or a phone call within a week of registering, please call us at 1 877 875 4676, Monday to Friday, during office hours. What if I want to cancel or change my monthly giving details? You can cancel, upgrade or decrease your monthly gifts at any time by calling our toll free number 1 877 875 4676. Any cancellations or changes made to a monthly donation will receive an email or phone call confirmation. You will receive a consolidated tax-receipt for all your donations in a specific year at the beginning of the following year (usually in February) to the mailing address that you provided. I’ve moved since I signed up for my monthly donation—how do I let you know? Please contact us by phone (1 877 875 4676) or email info@vghfoundation.ca with your new mailing address information at your earliest convenience. Additional inquiries can be directed to VGH & UBC Hospital Foundation by phone at 1 877 875 4676 / 604 875 4676 or by email to info@vghfoundation.ca.